The Video Games industry is huge these days, even rivaling that of the movie industry which means there are millions of people online every day looking for related content. As a web publisher, you can take advantage of this by providing a video game related website such as a portal, reviews website, fan site for your favorite game, offer mods, deals and offers and even live streaming or recording of your gaming on sites like Twitch and Youtube. Many people are making their living online from their favorite games – a dream come true ? 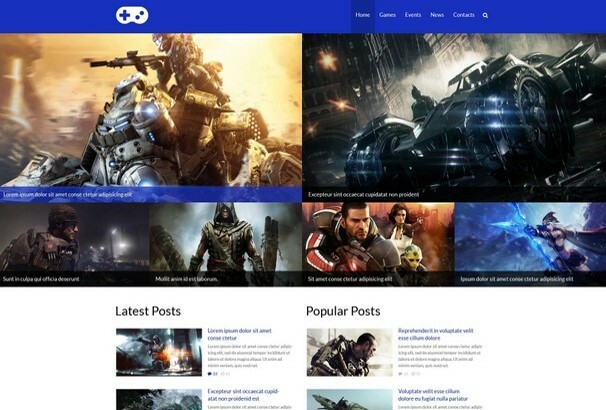 Its really simple to have your own gaming website, you can choose to use a Video Game WordPress theme or you could choose one of these 60+ Video Game Website Templates we have selected for you below. These are all themed around games and gaming and will allow you to quickly create a beautiful and modern website, letting the designer create the look of your site while you focus on providing the content. 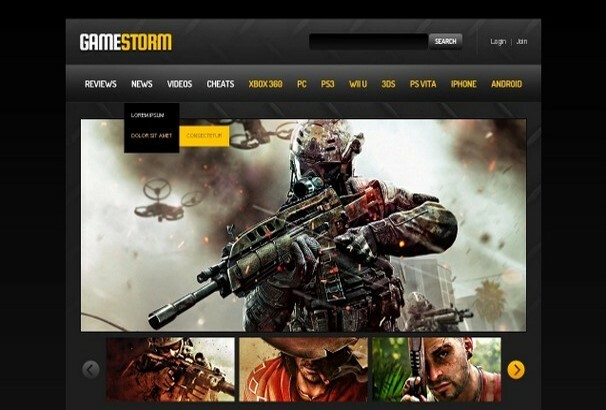 Check out our guide to the very best Gaming Website Templates. 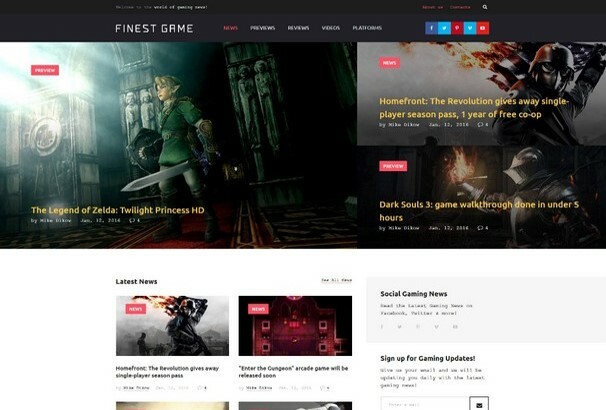 Finest game is an HTML website template which is perfectly designed for a gaming website. It has multiple header and footer layouts. It has also a huge set of UI elements and blocks. So you can easily create a professional looking website with few hours. It includes over 35 ready made HTML5 pages and 5 blog layouts. Live search and contact forms also integrated with this template. This is a simple and minimal website template which is suitable for a games portal or related website. This template is very light weighted and loads very fast. It has a live search option in the header area and comes with an awesome slider on the homepage. 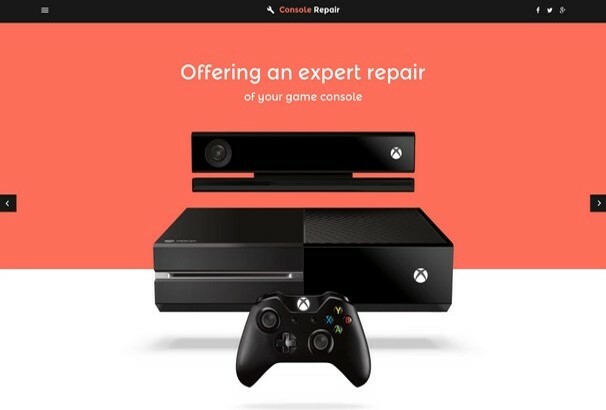 You can easily create a game portal using this modern template. 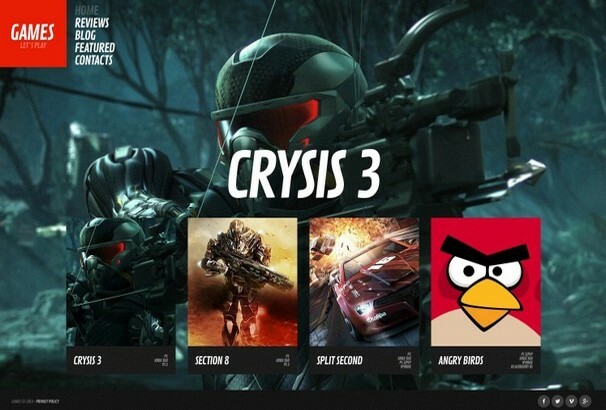 This is another exclusive game portal template. 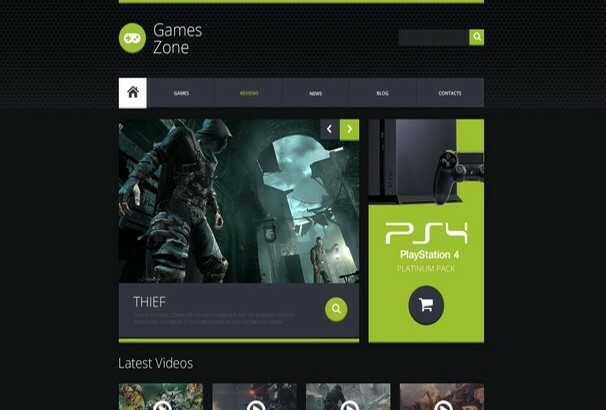 This template based on dark color which is great for a game portal. This template is perfect for setting up your gaming community and site. Social icons are added in the header area So you can easily add your social links there. This template is fully customizable and can possible to change everything as your needs. 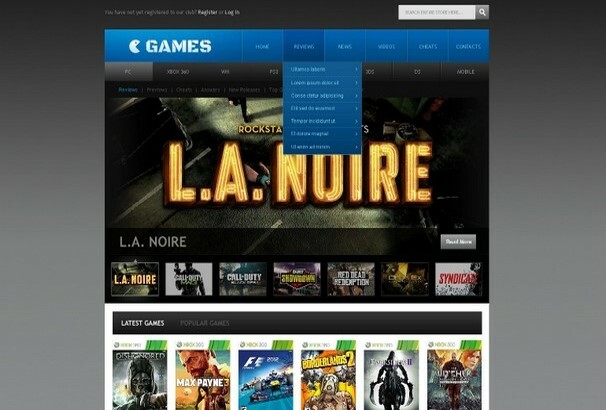 This template is perfect for gaming portal, online games, games review or anything else related to the games industry. This template based on dark color and you can easily place games information in blocks. This template also comes with plenty of pre-built HTML5 pages which are very helpful to create new pages for the website. 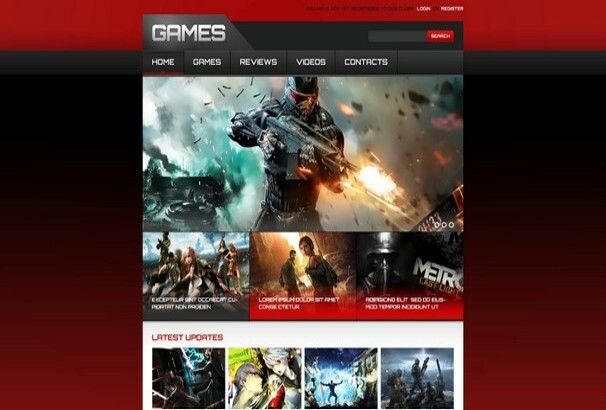 If you are looking for a super speedy website template for a gaming website, game portal, online gaming site then this template is perfect for you. You ‘re getting PSD and HTML files in the package which is very easy to customize. This template is perfectly designed with the power of HTML5 and Jquery. So you can easily create an amazing website by using this template. 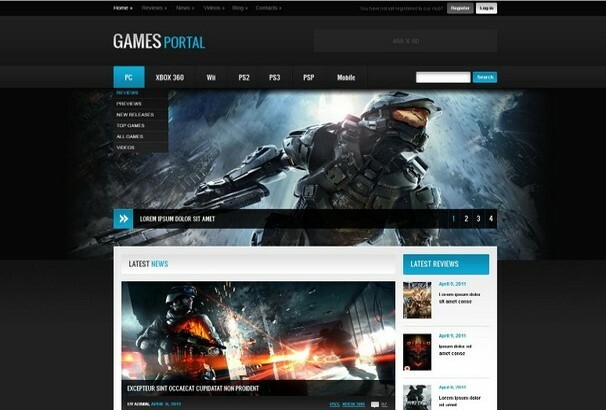 Game portal is a free high-quality website template that is perfect for any types of games portal. This template was created using the latest technology such as jQuery, HTML5, and CSS3. This template is very easy to customize that suit your needs. This modern and elegant template will help your site stand out from the crowd. 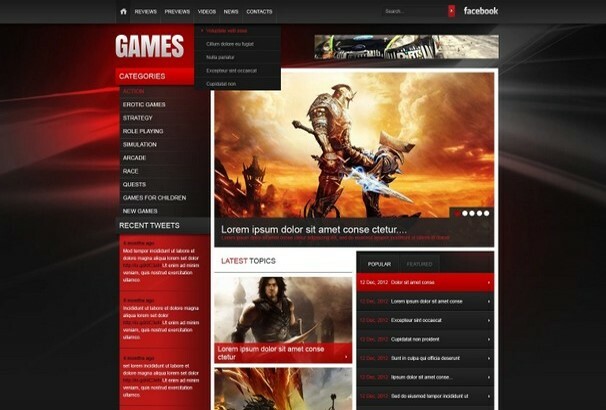 This is another high-quality website template which is specifically crafted for gaming websites. This quality theme is built with the latest technology such as HTML5, CSS3, jQuery. It has built-in registration and login page so a user can easily register your website in minutes. 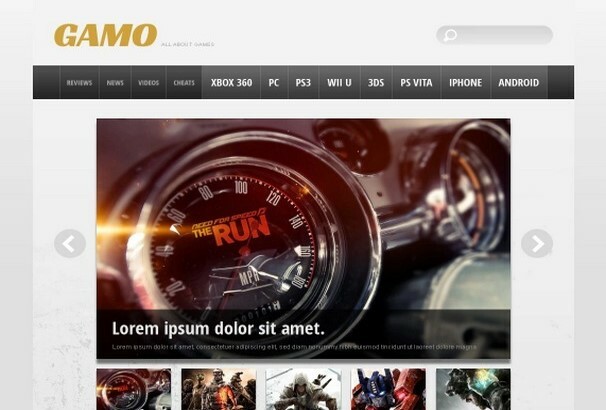 Gemo is another exclusive website template which is suitable for online games, games portal or gaming website. It is a clean and modern design template and easy to use and customize to suit your needs. This template was built with HTML5, CSS3, and jQuery. It’s elegant and modern design will help you to draw user attentions on their visits. 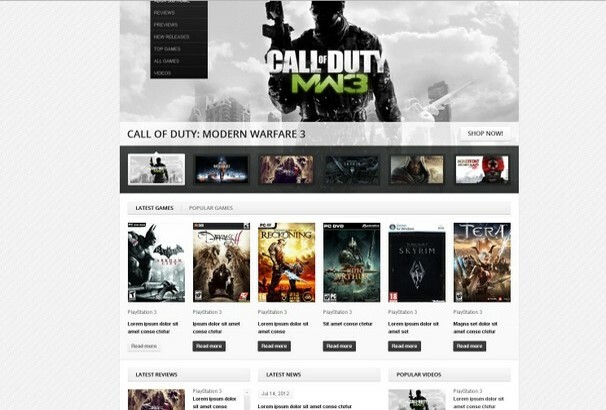 This is another minimal and simple website template which is perfect for any types of gaming website or portal. This template was created using the latest web development techniques such as HTML5, CSS3, and jQuery. If you are looking for a dark color based super speedy website template for your games portal then check out this template. This template is based on dark and orange color and perfectly crafted for a games portal. It has a live search option and an amazing slider on the homepage. This template was built with the latest technology such as HTML5, CSS3, and jQuery. 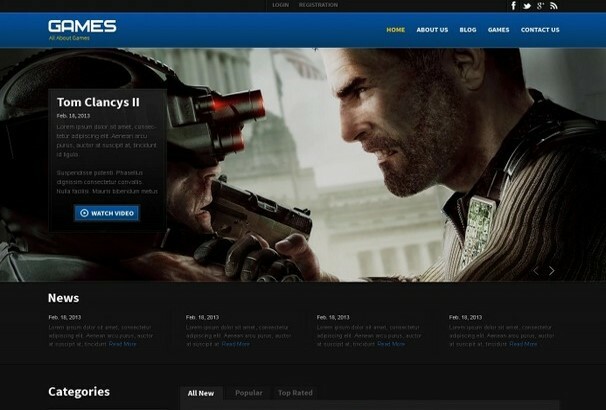 This template is 100% responsive and perfect for a games website. This template comes with an amazing slider. There you can place your custom slider with promos, new products or any other things you need to highlight. This template is supplied with a menu that sticks to the top of the pages as you scroll down. This keeps the main navigation menu right before the user’s eyes all the time. 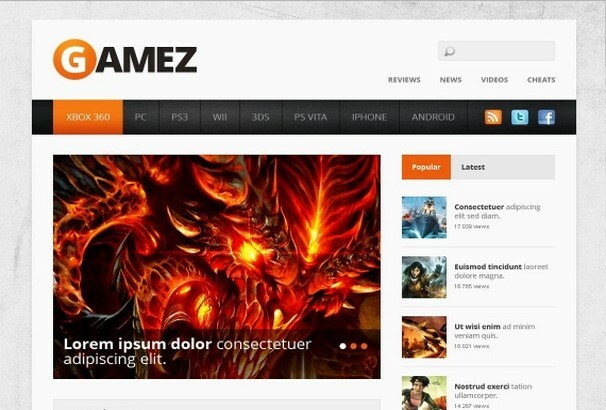 This theme in flat style was created for a gaming website or portal. This theme comes with pre-built extra page layouts and a great gallery functionality. This template was created using the latest technology such as jQuery, HTML5, and CSS3. 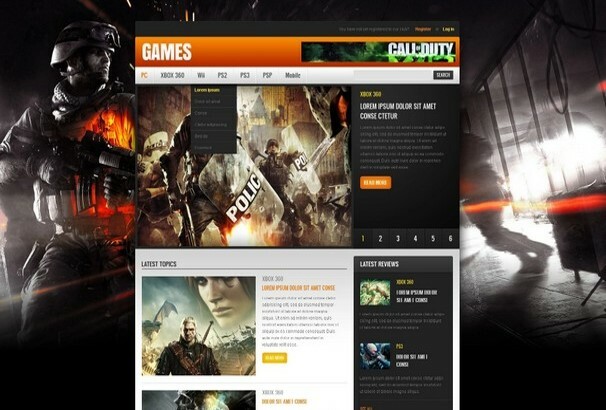 This is a simple but powerful games portal website template which was created for a gaming website or portal. The simple color combination will draw user’s attention to the important information. Its clean, elegant and simple design makes this template really outstanding. 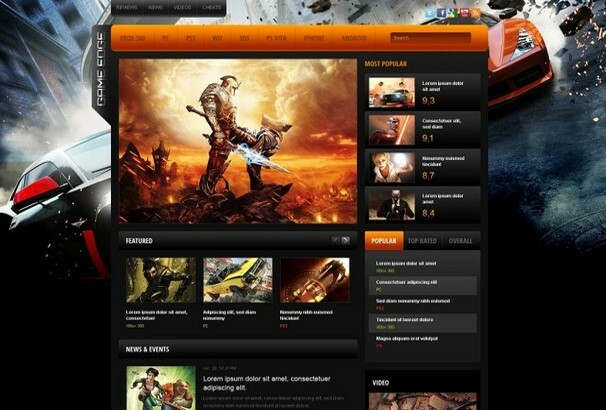 This is a high-quality website template which is perfect for any types of games portal or website. This template was created using the latest technology such as jQuery, HTML5, and CSS3. You can easily customize this template as your needs. This simple and elegant template will help your site stand out from the crowd. 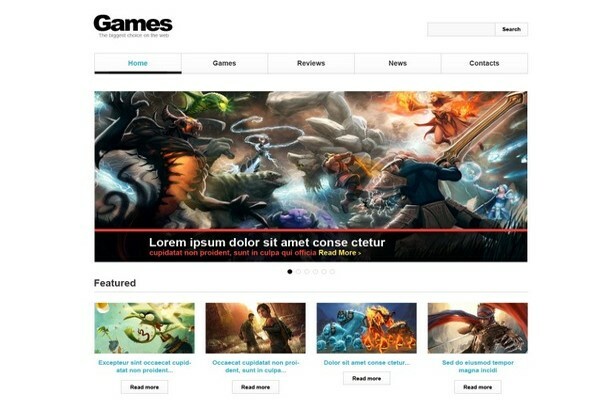 Games portal is a 100% response website template that comes with the 1170 grid system. This template was created using CSS3, HTML5, Semantic code, valid coding, and jQuery. It has cross browser compatibility and drop down menu functionality. Lots of useful forms are included with this template such as booking, registration, submission forms and etc. 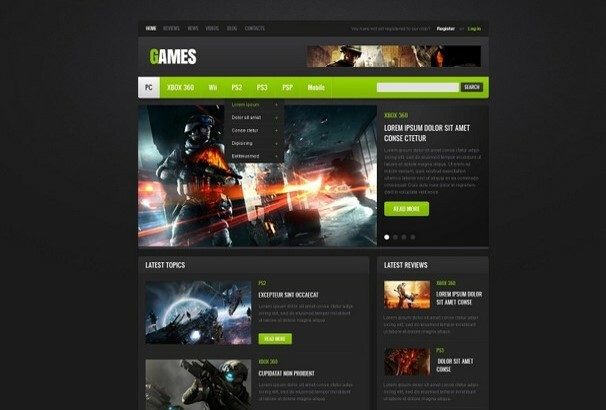 This is an exclusive website template which is perfectly designed for creating a gaming website. There are lots of features included with a template such as Advanced Theme Options, Sliced PSD, Back To Top Button, Calendar, Categories Accordion, Google map, Google Web Fonts, Live Search, Modules Bundle Install, Gallery, Tabs, Tag Cloud, Tooltips, Quickstart Package, Sample content, Social Options and much more. This unique designed website template is perfect for any types of a gaming website. This template contains lots of amazing features such as Sliced PSD, google maps integration, google fonts, favicon option, google web fonts and much more. This template was created using latest web technology such as CSS3, HTML5, jQuery. It is 100% responsive web template and works perfectly on every device. 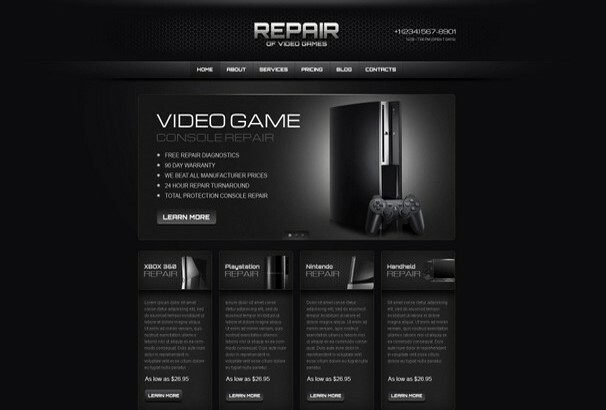 This is another exclusive website template created perfectly for a gaming website or portal. 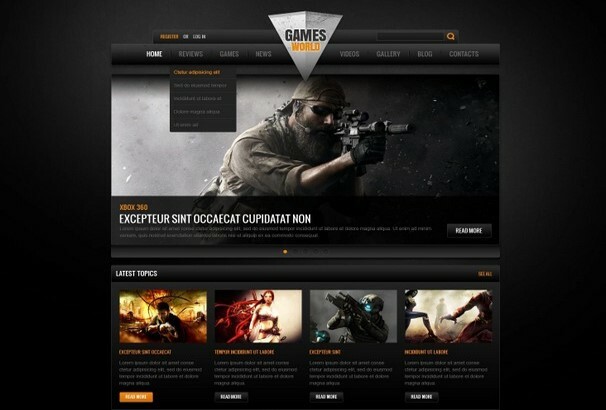 You can easily customize this website template and create an amazing games portal within very short time. This template was created using CSS3, HTML5, Semantic code, valid coding, and jQuery. This color combination of this template is really outstanding. 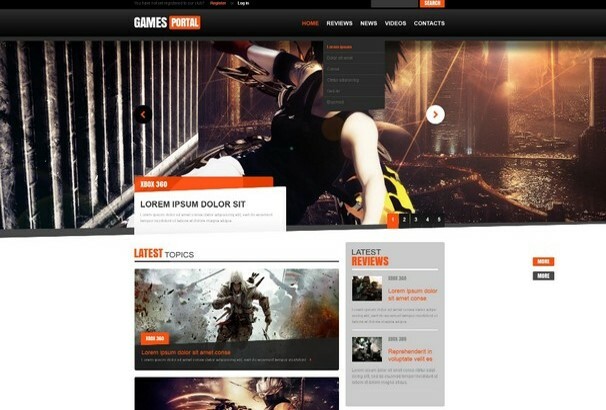 This is 100% responsive website template for games portal. Your site will quickly adapt to any gadget with any screen size the user has in hand right now. Text and images are flexible as well, so they will be rendered correctly. This will boost your conversation as your visitors will not be restricted by any limits in terms of their location or device. 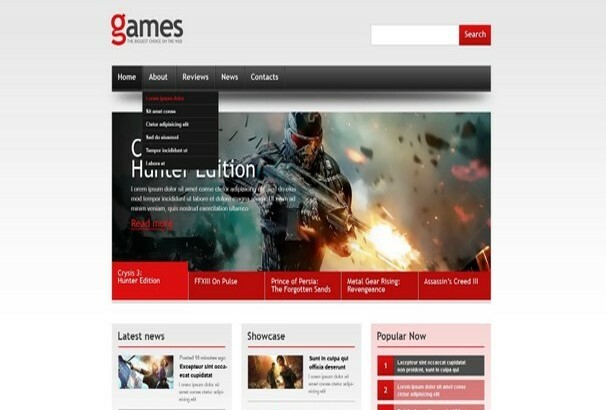 This is another responsive website template which is perfect for any types of games website. This template is built with HTML5, CSS3, Sass and jQuery. It is fully responsive and very flexible and easy to customize to suit your needs. This template is 100% responsive and comes with plenty of example pages which are very helpful to create pages for your games website. It is mobile, responsive and looks great on all devices and browser. The template comes with two column layout and the width of this template is 1280npx. This template is integrated with google map and contact form. 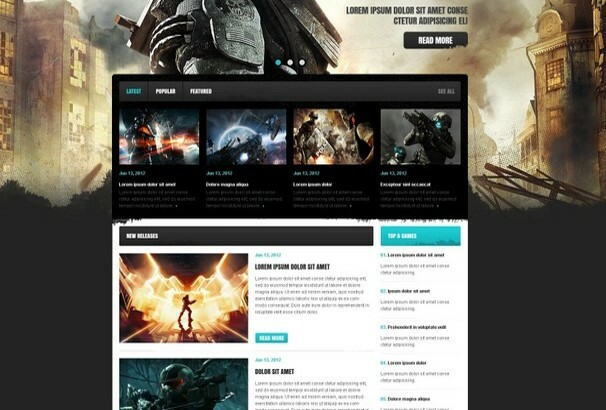 This is a uniquely designed website template that is perfect for games website or portal. This template is 100% responsive and it looks perfect for every type of devices such as mobile, tablets, laptops. It has cross browser compatible and integrated with google maps and google fonts. This is an elegant and modern website template. You can use it for creating a games website or portal. This template is fully responsive and it works perfectly on every device. There are lots of features included with this template such as Cross-browser compatibility, drop-down menu, google web fonts and maps and much more. Advanced search form and content form also integrated with this template.